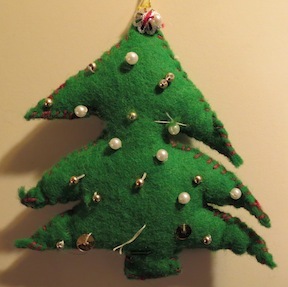 These felt Christmas ornaments make wonderful homemade decorations and are a very satisfying craft for children to make. They can also be brought out year after year! 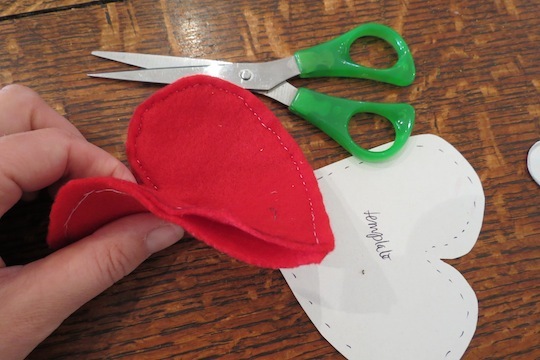 This tutorial shows step-by-step how to make a heart ornament, but you can make an Xmas tree by following the same steps and principles. 1. Draw a large (approx. 10cm high) Heart or Christmas tree onto cardboard and cut out. Draw around your templates on a double piece of felt. 3. 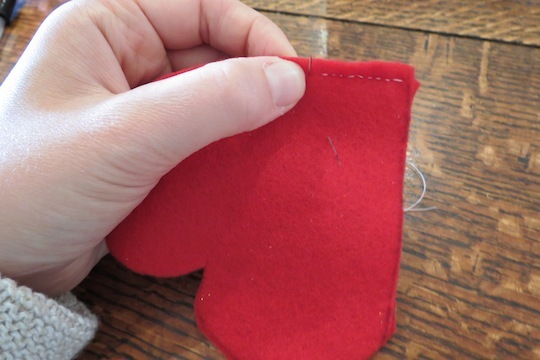 For a Heart: Start at the point and sew the pieces together with basic running or backstitch. Stop sewing when you have approx. 2 inches left to sew. Do the same for a Xmas Tree. 4. Turn the shape inside out. You will need to use a pencil to push the corners of the heart out. Make sure you have left yourself at least a two inch hole to make this process easier. 5. Now you can stuff the heart or tree. We used cotton wool or thin dish clothes as they are cheaper than special textile wadding. 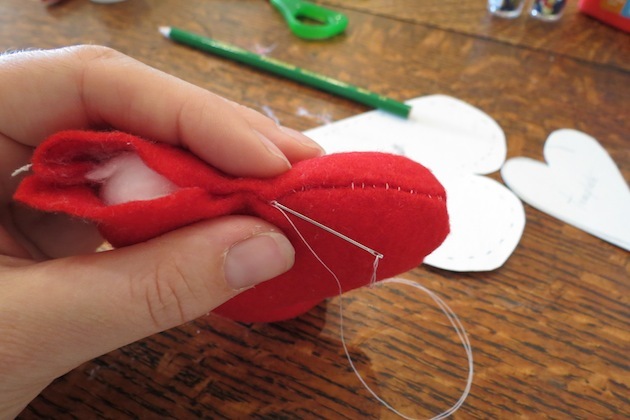 Use a pencil to push the stuffing into the corners of the shape. 6. Sew up the hole by folding in the edges and doing and do small stitches along the inside of the fold to sew the pieces together. 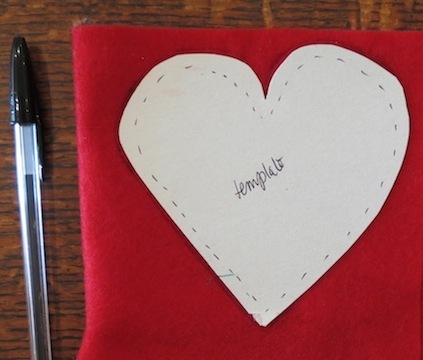 You may need to help your kids at this point as folding the edges in can be a little fiddly. 7. Sew a piece of ribbon at the top with a couple of stitches. Here is an example of a Xmas Tree made by a 7 year old. Beads, sequins and pearls have been added as decorations and the tree is sewn together in red thread giving it a really festive feel. So sweet! 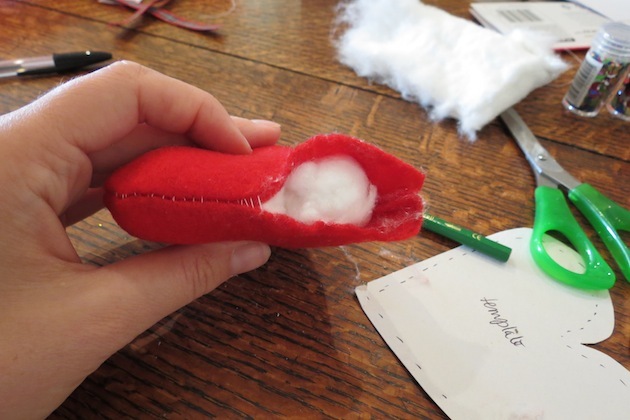 These are a great option for preschool and younger children to make. Decorations e.g. coloured foil, sequins, beads, sweetie wrappers etc. 1. Cut out a template of a heart from cardboard. You could cut a number of these. 2. 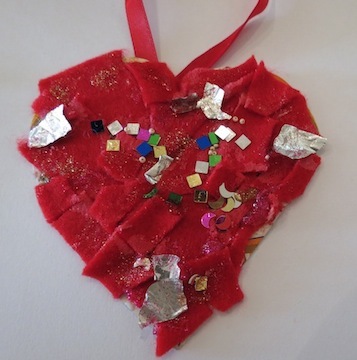 Cover the cardboard heart(s) in glue and stick felt scraps, foil, sequins and other decorations on with PVA glue. 3. 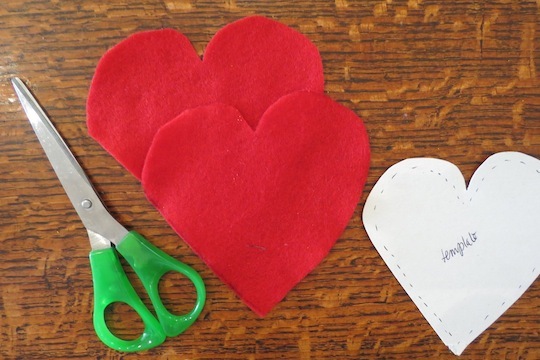 Attach a ribbon to the back of the heart with sticky-tape. These ornaments make wonderful tree decorations. I hope you enjoyed our instructions for making felt Christmas ornaments. 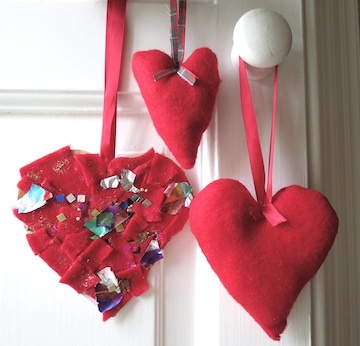 We will be adding more ideas for making felt ornaments for different occasions so keep coming back!